Martin’s Super Markets has announced details for its ninth annual Veterans Day Honor Meal event, scheduled for Sunday, November 11 (Veterans Day) at all 21 Martin’s locations. From 10:00 a.m. to 2:00 p.m. on November 11, any active, inactive or retired military veteran of any U.S. service branch is eligible to receive the free meal, available at any Martin’s Deli. To receive an Honor Meal, a veteran, either retired, discharged or in active service in U.S. (Federal) armed forces units or National Guard units may be asked to show his or her Military Identification Card at the checkout, and the meal will be free. No purchase is required, nor does a valid Martin’s Advantage Card need to be presented to take advantage of the offer. Holder of military ID Cards issued to dependents and spouses of active or retired service members are not eligible for this offer. Those without ID will receive the free meal upon request. 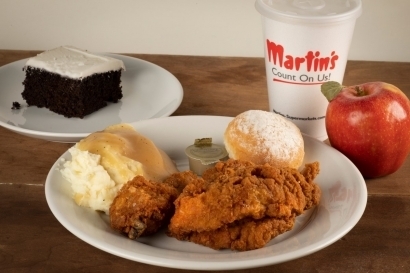 This year’s Honor Meal will include: two pieces of Martin’s Deli Fried Chicken; a side of mashed potatoes; a side of cold salad; a roll; a hot or cold 16 oz. Deli beverage; a single serving milk; a serving ice cream; a fresh Gala apple; and a slice of Martin’s cake (cake while supplies last). Meals are available for eat-in. Minimal carry out packaging will be available due to the volume of meals expected to be served during the Honor Meal period. Stores that do not normally have eat-in Deli areas will set up special seating on Veterans Day to accommodate their Honor Meal guests. Veterans are encouraged to enter in a free drawing at each store for the chance to win one of 42 $50 Martin’s gift cards, courtesy of Eckrich®. Winners do not have to be present to win. In addition, Eckrich®, the makers of naturally hardwood smoked sausage and perfectly seasoned deli meats, is joining Martin’s Super Market at 525 S Mayflower Road in South Bend on Nov. 11 to honor the community’s local veterans. Eckrich® and Martin’s will thank a few deserving service members and their families. This event, in collaboration with Martin’s Super Market, is part of Eckrich®’s ongoing commitment to honor, recognize, and support military families across the country. To learn more about Eckrich®, visit Eckrich.com. Martin’s Super Markets was founded in 1947 and currently has 21 stores in South Bend, Mishawaka, Granger, Elkhart, Goshen, Plymouth, Nappanee, Logansport and Warsaw, Indiana, and Niles, Stevensville and St. Joseph, Michigan. The company also operates 17 in-store pharmacies, a pharmacy at Saint Joseph Health System in Mishawaka, a Martin’s Express convenience store in South Bend and a Side Door Café at Elkhart General Hospital.